Vikings rookie wide receiver Cordarrelle Patterson was the league's leading kickoff returner with a 32.4-yard average. EDEN PRAIRIE, Minn. — Cordarrelle Patterson’s scintillating rookie year is over, but the Minnesota Vikings’ young receiver and returner is still having a big week. Patterson, the league’s leading kickoff returner with a 32.4-yard average, was named a first-team All-Pro on Thursday and was added to the Pro Bowl as a replacement at returner for Pittsburgh’s Antonio Brown. Running back Adrian Peterson, who finished fifth in the league in rushing with 1,266 yards, was named a second-team All-Pro. Patterson will be joining Peterson as the two Vikings selected for the Pro Bowl. Peterson was named to the team as part of the original voting. "Thanks to all the #flashyfans Vikings will be represented at 2014 ProBowl. 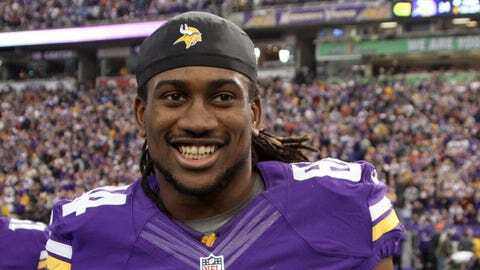 My rookie year just got better!," Patterson wrote on his Twitter page (@ceeflashpee84) on Thursday evening. Patterson might have been passed over initially because the Pro Bowl has done away with kickoff returns in the annual all-star game. The two returners selected last week were both punt returners in Brown and Kansas City’s Dexter McCluster. But he wasn’t passed over a second time when the league needed a replacement. Patterson set several records in his first NFL season, after Minnesota traded four picks to the New England Patriots for the right to select Patterson at No. 29 overall in the 2013 NFL Draft out of Tennessee. He set a record for the longest kickoff return in NFL history, and tied the NFL record for longest play, when he returned a kick 109 yards for a touchdown against the Green Bay Packers. He established a Vikings records for kickoff return yards in a season, and was the only player in the NFL this season to score multiple touchdowns in returning (two touchdowns), receiving (four) and running (three). Patterson was named one of five finalists for the Pepsi Next NFL Rookie of the Year award on Friday, joining San Diego receiver Keenan Allen, Buffalo linebacker Kiko Alonso, Cincinnati running back Giovani Bernard and Green Bay running back Eddie Lacy. Patterson finished with 45 catches for 469 yards and added 12 carries for 158 yards to go with his nine total touchdowns. He was second in the league behind Philadelphia’s LeSean McCoy in all-purpose yards with 2,020 yards. Vikings sign two to future contracts: Minnesota announced Friday it signed guard Josh Samuda and receiver Kamar Jorden to reserve/future contracts. Samuda, 25, didn’t play last season after being released by the Miami Dolphins prior to the start of the season. The 6-foot-3, 315-pounder spent 16 games with Miami in 2012. Jorden, 24, played in the Arena Football League last season. Jorden, 6-foot-3 and 205 pounds, is out of Bowling Green.